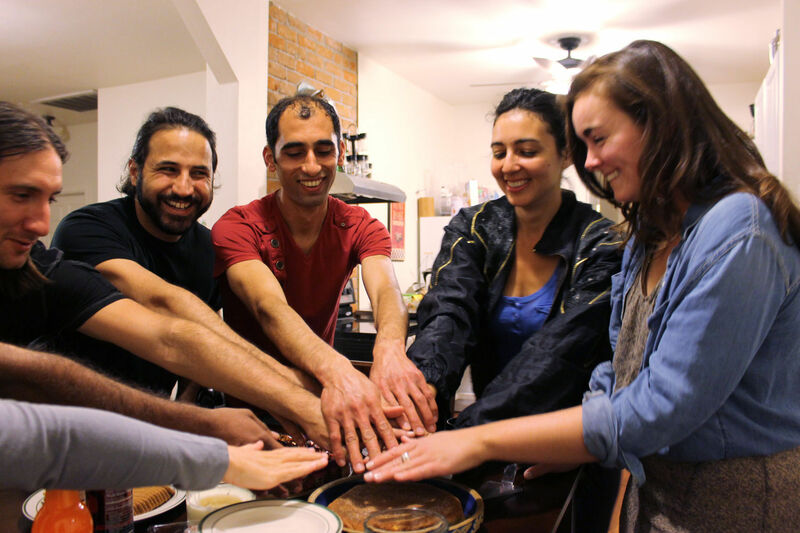 Mounis Hammouda, center, a Palestinian from Gaza seeking asylum, celebrates his 30th birthday in Tucson with friends. Photo by Perla Trevizo/Arizona Daily Star. One of two Palestinians seeking asylum celebrated his 30th birthday this week in Tucson after being released from an immigration center 80 miles north of Tucson. Mounis Hammouda presented himself at the port of entry in Nogales in November 2014 and asked for refuge. He was detained at an Immigration and Customs Enforcement center in Florence while his case was processed. Hammouda was released earlier this month, after members of the University of Arizona Students for Justice in Palestine chapter helped raise the $9,000 he needed to pay for his bond. He now lives with one of them close to the UA campus while he awaits his work permit.